I hope you all had a great week! 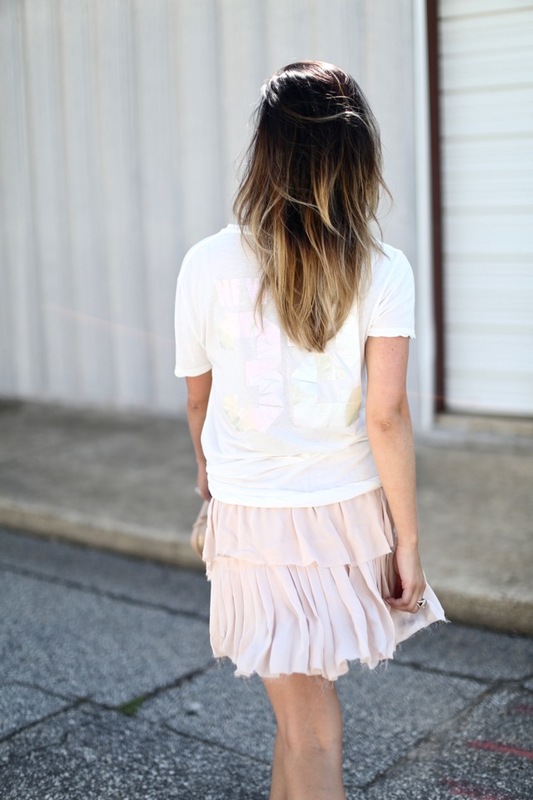 There are so many things I love about this casual look, but this skirt is hands down my favorite. I've loved the brand for a while and was waiting on it to come out in the perfect color, and it doesn't get much better than blush, in my opinion! I wore this easy, comfortable outfit to brunch with friends last weekend - such a perfect weekend look! What are you guys up to this weekend? My best friend is in town this week so we're spending time with our families this weekend and hoping for a little sunshine! It's been raining for days and I'm so ready to be by the water + grill out! Cheers, loves! That is such a cute skirt! I love the way you dressed it down with a tee and sneakers! White and light pink are my absolute favorites together! I love the color of this skirt, not to mention the lovely ruffles! I think pairing it with a slouchy white tee and tennis shoes was also an excellent styling choice! I love dressing down skirts and dresses with these articles of clothing. You're looking adorable in this simple, sporty combo!